I’ve been trying to get to Kuala Lumpur for almost two years. Initially, it was just an exotic sounding city in South East Asia and not on my must see list. Then, when I started looking for international teaching posts, it kept coming up so I researched it a bit more. Suddenly, it sounded right up my street! So, I applied for and even interviewed for, teaching positions, but I was persistently unsuccessful. The closest I could get was Myanmar, a 2.5-hour flight away. So, close, but no cigar! When I got to Myanmar I didn’t book KL straight away either. Singapore came first, a place I’d wanted to visit for about twelve years. Instead, I chose to book a long weekend at the end of February. But that went awry when I had to renew my passport in February in preparation for my travels later in the year. So I rearranged, and finally got there in April, escaping Myanmar’s Thingyan Festival. And I’m so glad I did. My instincts were correct. KL is great; modern, clean, logical, friendly, everything I’d want in city living. It’s not perfect. I’d been warned by friendly Malaysians I’d met on the circular train in Yangon, months before, that it was a dangerous place for a woman alone. ‘Hold on to your bag, don’t walk about late at night.’ I took all the usual precautions and felt no more at risk than I do in London. Less, in fact, as KL is not as crowded, at least, not in April. There are still dodgy taxi drivers (mine tried to take me round the entire city to my hotel when actually it was right up the street from where we’d dropped my friend off. Luckily I have sharp eyes! ); old, dirty busses, broken pavements and heavy traffic but they fade into insignificance when I consider the positives. First and foremost, the people are lovely. Malaysia is a cultural melting pot of Malay, Chinese, Indian and, of course, expats, which creates a diverse but thriving cultural identity that lacks the pride of Singapore and the reserve of the Burmese. I had lots of chats with people, on the train, in the street, in restaurants. They engaged with me, not to practice their English but because they were interested in why I was in KL and were keen to talk about their country. Malaysia’s economic growth has been impressive over the past few years and the country’s plans for the future are huge, and they are understandably proud of that. Kuala Lumpur radiates a cosmopolitan and laidback atmosphere that beat’s Singapore’s haughty detachment hands down. Like Myanmar, people do smile at you although, as I’ve found with all Asian countries, they’re not so great on spatial awareness! Also, they are not too bothered about rule following, which was refreshingly normal compared to the restrictions I’ve felt in both Singapore and Myanmar. The only time I was disturbed by this was on the train home from Batu Caves. I’d noticed that there were ladies only carriages so I entered one for the journey home. You couldn’t miss the pink signage and images indicating ladies only (small children excepted) yet males persistently entered the carriage and remained there. Some, on looking around, realised and moved on, others resolutely remained despite tannoy reminders and a ticket inspector (who did little about them except check their ticket). As I’ve got older I’ve come to accept that you don’t have to follow all of the rules all of the time. I’m even getting better at breaking some of the sillier ones myself (don’t laugh, those who know me well know how far I’ve come!) But for something like this, where religious and cultural sensibilities are at stake, to disregard another’s wishes seems disrespectful, and an unnecessary breaking of the rules. How hard is it to move to the next carriage and allow people to travel comfortably as they choose? In my conversations with fellow train travellers the usual questions were used to open communications (‘Where are you from? Are you on holiday?’) but while in Myanmar they often stop there, in KL they are maintained and developed. One man, after enquiring if I came from Liverpool (like Gerrard), then told me he wished to holiday in Bournemouth, because it was cheaper than London. (I hadn’t the heart to ruin his ambition!). Another, Sam, adopted me on the train to Batu Caves, had a long conversation with me about the instability of some ASEAN countries and gave me an impromptu tour of the caves, simply because he was a good man, proud of his country and his heritage. He was on his way for his weekly blessing and I was conscious that I was delaying him well beyond his usual visit as I prevailed on his kindness. 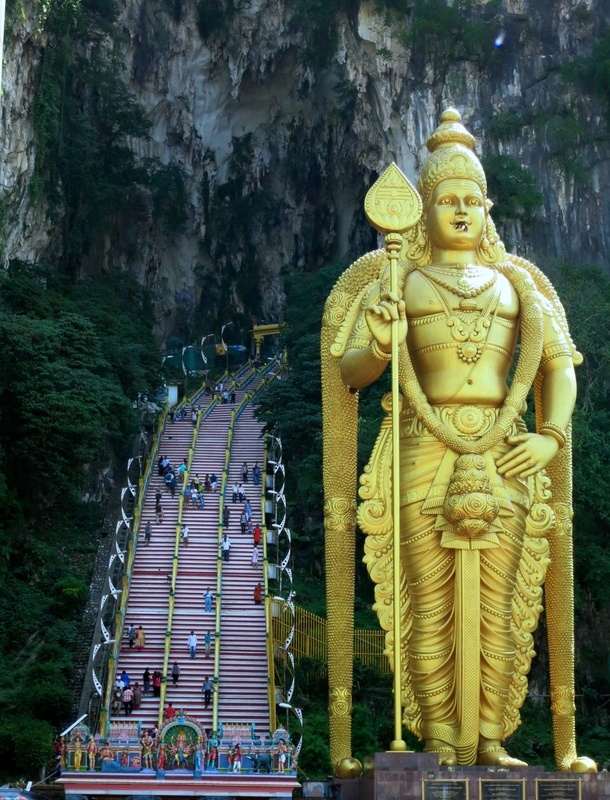 Another instance of this amazing kindness happened, again, at Batu Caves. Having visited the temple and climbed and descended the 272 steps, avoided the monkeys and taken the requisite photos, I felt quite peckish and entered one of the nearby cafes in search of lunch. I chose a place that offered north and south Indian cuisine and I chose a 10RM platter of curries and rice. The waiters brought me my choice, on a banana leaf, and served me steaming dhal from a stainless steel bucket. I’ve no idea what I was eating with my poppadums’ (replenished regularly until I had to say no more) but it was delicious and I suspect my face said as much. Part of the way through my meal there was a bit of a commotion as a Malaysian gentleman finished his meal and requested his bill. He pointed at me and the waiters waved a piece of paper in my direction then handed it to him. I paused, looking quizzical, and was told, first by a waiter and then by the gentleman himself that he had bought me my lunch and there was no need to pay. I was flabbergasted, and touched, made my profuse thanks and shook hands with my benefactor before he made his benign way out of the cafe. I didn’t know what else to say and I didn’t like to ask why and seem like a suspicious Westerner, as I could find no agenda to his actions. I think I was the lucky recipient of a selfless gesture, but never having experienced such genuine kindness before I was unsure how to respond except to make me feel even more affectionate in my regard for Malaysian people. It also made me realise, once again, how lucky I am to be able to travel and interact with others on such a level. To be honest, it was the people who made the place for me. KL was a very welcome change of scene after three solid months in Myanmar. There isn’t actually a lot to see there, after the Petronas Twin Towers, KL Bird Park, Batu Caves and the Hop-on Hop-off bus tour I’d done pretty much all I needed to do for a first visit. More importantly it provided me with Westernised food and shopping and a reassurance that actually I can navigate my way around a strange city (something I’ll never master in Yangon). But my abiding pleasure came from the smiles of the people, the conversations and the generosity of spirit I encountered everywhere I went. And that wasn’t reserved just for when I was in KL. Penang made me feel the same, and my greatest regret was not thinking ahead enough to extend my stay and visit Langkawi before heading back to Yangon. When I think about the future and the notion of settling somewhere, Malaysia seems like a very good possibility. But until that happens I’ll simply have to keep going back to visit. Disclaimer: I am not a foodie, not in the truest sense of the word. I don’t really enjoy the process of creating meals. No sense of smell and a limited palate make it difficult for me to really reveal in all the sensory delights cuisines have to offer. I can cook, and I definitely enjoy eating, but what I enjoy even more is being fed. In Penang, I was fed. Having sated my desire for Western foods in Kuala Lumpur I moved on to Penang because of its foodie culture. Situated 365 km from KL and listed as one of THE Islands to visit, explore and eat on before you die, I wanted to discover new and exciting dishes and taste new things. Malaysian food is a fusion of Chinese, Indian and Malaysian tastes and textures that are all new to me. I couldn’t find anything even remotely similar to my British experiences of these foods, and I really didn’t want to either. This was the real deal. Another gentleman, possibly the owner, came and placed a plastic plate before me with four brown paper parcels on it. These parcels seemed to be on every table. ‘Try it’. He grunted. On further investigation I discovered that the package held a banana leaf containing a curried rice mixture and a small piece of fish. I was halfway through it when my original breakfast order arrived. Of course, it wasn’t as straightforward as I had imagined. My tea was made using condensed milk but I had gotten used to that in Myanmar. 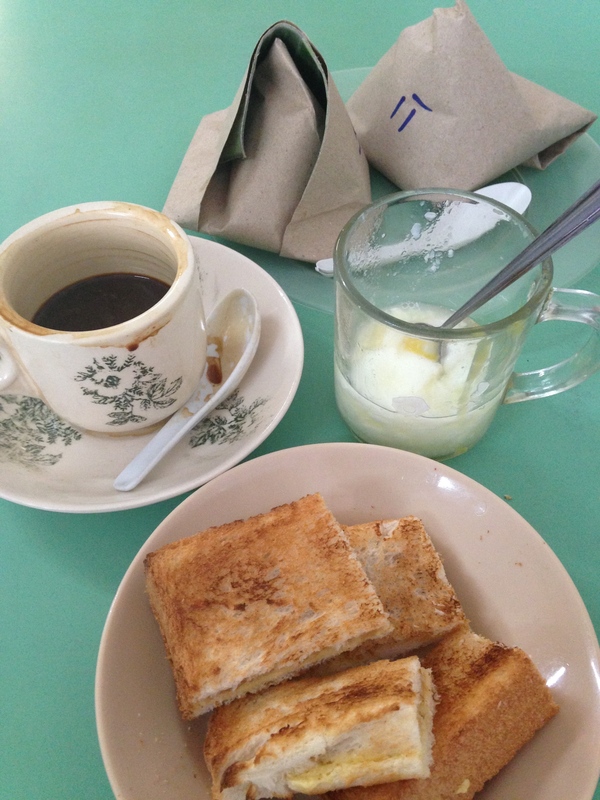 My toast was sweet, filled with butter and coconut jam, and my boiled egg was so runny it came in a cup! And it was all really nice. I added pepper and soy to the egg, dipped in my toast and managed to devour the whole lot very quickly. I didn’t quite manage to finish the nasi lemak, as I learnt to name it, and I was asked if it was too spicy. It wasn’t, but curry for breakfast, accompanied by more sweetness than I’d eaten in a month had become a bit much. I was given a quick lesson in Nasi Lemak varieties (there’s also prawn, chicken and lamb on each plate) and then I paid a whole 4RM for it (approx.. 70p or $1). Amazing! My next experience was the Heritage on a Plate walking tour. 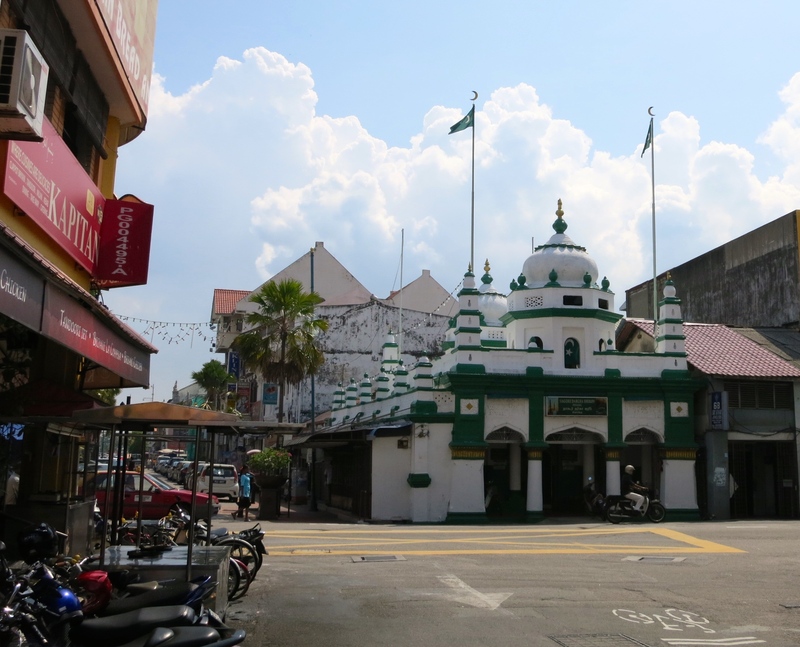 I’d found this on TripAdvisor and booked to join a group to do a tour around the old-quarter, Georgetown, a UNESCO World Heritage site. I wish I could regale you with all the names of the different things we tried but I’m going to have to confess I couldn’t retain half of them, and my ability to grasp any ASEAN language is pretty poor. I find things really hard to pronounce, and therefore remember. But I know I enjoyed it! I certainly tried everything: mango lassi, ambarella (which is a sour and salty plum juice), Chinese fried foods including tofu, prawn, crab cakes and sausage, an Indian omelet thing (see what I mean about remembering names!) in both beef and chicken, a wonton noodle soup, pancakes and puthu. I even tried a century egg! (Eggs that are preserved in a clay/ash/quicklime coating for months until the yolk turns grey and the white becomes a sort of brown jelly. Yum!) The only thing I didn’t like was puthu. It is a dry rice pudding served with grated coconut and a special brown sugar that reminded me of molasses. Now, while I drink coconut water and eat coconut curries, since a child I have always hated it on its own. It may be a texture thing, but the whole combination was wrong! The rest of the experience however, was lovely, and gave me greater confidence to try street food and enter local eateries. I haven’t done that so well in Myanmar. Mostly because many of the places don’t look clean and also because the food, which either seems fried or watery, looks unappetizing and beige. Additionally, on the few occasions when I have tried the traditional food, I have been very sick afterwards, while others that shared the meal with me remained perfectly well. It makes me think that there is an ingredient, maybe a spice or possibly the oil, that is habitually used, that doesn’t agree with me. I had no such reservations in Penang though. The following day, I revisited the Tang Bistro, the starting point for the food tour and a heritage café/ hotel, to indulge my need for chocolate brownies (with ice-cream). Before that I had also had a curried lamb wrap that was simply superb and a calamansi freeze. Not so street or heritage, but very nice and an indication that anything goes regarding food here, as long as you enjoy it. In the evening, I wandered until I found the hub of Chinatown’s street food. There, a nice vendor introduced me to the concept of choosing and cooking my own skewers of clams, tofu, chicken and mushrooms (and lots more besides) by dipping them in boiling water, then, when cooked, smothering them with satay and sweet or hot chili sauce. As a rule, I don’t generally mix sauces, if I have them at all (my limited palate means sauces make everything taste the same!) but I went with it and actually, I started to enjoy it! As an appetiser, it was good, and I devoured it on the street with relish. To pay, he counted the colour-coded sticks I handed to him and I handed over a ridiculously tiny sum for a plate full of seafood! Moving on to another part of the street, I chose seafood fried noodles and sat at a table to wait for my meal. These are hawker stalls, meaning the table is owned by one person, who will supply you with a drink that you pay for on delivery. Then, your food will be delivered by a young hawker from whichever food stalls you’ve visited, and you’ll pay them on delivery too. The noodles were good, which I duly told the owner when he enquired! I looked for a pancake stall to finish, but was sadly unable to find one, so I walked home in the rain, full up, on about £2 worth of good food. On another evening, I visited Little India and indulged in a chicken biryani claypot and lots of mango lassi. Delicious! My view while eating a tasty biryani. On Penang Hill (really not worth a visit) I tried Char Koay Teow, which is an iconic dish of garlic, prawns, noodles, egg and cockles. It was whipped up before my eyes in a little food court at the top of the hill and was consumed just as quickly. The beauty of street food is, of course, watching the creation of your meal. Chefs have choreographed a rhythmic ballet of chopping, stirring, swirling and serving that creates art on many different levels before your eyes. It is beautiful, and mouth watering! At Miami Beach, around Batu Ferringhi, at a tiny roadside stall, on a sliver of land between the road and the sea (there was no beach, the tide was in! ), I was offered Laksa, a spicy soup with thick noodles that warmed me right up after getting drenched in an unexpected downpour in the nearby National Park. In fact, wherever I went, a vast array of foods was available to me, and I really didn’t hold back. In fact, my only difficulty was in deciding what I wanted to eat each day. And, before you call me a pig, I should point out that portions are not large in Malaysia. Nothing is supersized here. There is enough to satisfy but not so much that you can’t walk on a little further and try something else if the fancy takes you. It has been an education. I have been very well fed and had my enthusiasm for food renourished thanks to my Penang trip. My only regrets are not staying longer, and eating more! A festival is brewing. Like a much-needed storm to break the hot and humid weather, Thingyan is needed to clear the spirit and renew the soul in preparation for the Myanmar New Year. Four to five days of washing away one’s sins of the previous year makes one ready to pay obeisance to your elders, make New Year’s resolutions and gain merit or possibly even become a novice and join the monks to be immersed in the teachings of Buddha. It is also the opportunity to gather together (the Government having relaxed the rules on mass gatherings for this period), throw water at each other, play pranks, dance, and eat. It is a boisterous time that allows the normally calm population to let off steam (literally, when drenched with cold, dirty water, in 40 degree heat!). The Burmese enjoy a good celebration and will find any excuse to have one. Aside from the public holidays (often dictated by Government, not calendar) there are often festive parades occurring. Drummers, pipers and singers crowd onto the back of a truck, broadcasting tinnily to the world through speakers tied onto the roof with rope, for any number of unfathomable religious reasons. But they are growing in size, volume and frequency as the countdown to Thingyan continues. Anticipation has risen with the temperature in Yangon. Stages, called pandals, which double as water spraying stations and dance floors, have gone up around lakes and on key roads, often sponsored by rich and powerful families in the area; yellow Thingyan flowers (padauk) have been decorating businesses and taxis for weeks; hoses, water pistols and plastic wallets to keep your phone dry have been on sale on stalls and in supermarkets or sold on the road by strolling hawkers; the population has got slower and lazier and the taxi drivers crazier as the excitement has grown. The day before festivities really kick off everything seems quiet. The city shuts down for the week and many businesses have started their holiday early. A sense of calm holds back the tide of celebrations. But for how long? The religious broadcasts so beloved by our neighbourhood start early in the morning. Actually, the festivities began last night with what sounded like a Bollywood party happening somewhere nearby. By 5am the megaphone sermons are underway at one of the monasteries close by. Yet, from my building, everything seems normal. There are less people on the streets but life continues to pass close by and everyone seems dry and happy. Later, I spot one or two boys on bikes, dripping wet and looking for the next soaking. I start to wonder if going out is a good idea but having made myself stay to see the event I know I will have to go eventually, or kick myself for a missed opportunity. I venture out around 5pm. The day is cooler, a little over cast, and safer than venturing out, pale skinned, to get soaked and burnt in the hottest month of the year. At first, nothing happens. I start to wander around the neighbourhood but the streets are very quiet. Then I see a small boy, looking nervously at me with a plastic bucket in his hand. His father is with him and I smile at him, and nod. The father encourages his son to approach me and douse me with water. It is very gently done and I only yelp because the water is quite cold! The boy beams, and so does his father, as I mumble Happy Thingyan and walk on. Suddenly, the streets seem full of small groups of children and men with hoses, buckets, water guns and loud music. I deliberately take paths that lead me past them, smiling and nodding to let them know it’s ok, that I want to join in, although the fact that I’m already wet helps take away their caution. I’m often escorted through the melee by a parent, and asked if I’m OK? Passers by smile and laugh with me (and at me!) It is a sweet experience. I head down towards Insein Road where loud music suggests a more boisterous atmosphere. There are no stages on Insein or Inya Lake Road nearby. If there were, the already unbearable traffic would grind to a halt. I can see the road glistening in the sunlight before I even get there and as I turn on to it I see a small water station dousing passing cars. Many people are crowded onto the back of trucks rolling slowly past the stations cheering and yelling and throwing water back out onto passers by. The bucket aimed at me missed but I was caught instead by a little old lady in a food stall, who got me square in the back with a cup of water. I spun around and laughed when I realised where the water had come from, and she laughed with me. After a while, I head home, water logged, with squeaking shoes. I can imagine that over the week, the water-fights become less reverential and I know from my students that it isn’t always the charming experience I had. Water from the lakes (or worse) is used, as residential water is limited until the monsoon season starts in a month or so. And the water here is not safe to ingest at any time! Pranksters are known to put ice, or worse still, stones, into the buckets of water that are thrown and drinking (and drink driving) results in plenty of accidents. But my brief experience of Thingyan was positive. I return home feeling baptized and ready to begin my own new year. I start my travels again tomorrow and I hope I can now go with an open heart and soul, ready to embrace another new phase of my life.